What Herbs Should Not Be Planted Together? The idea that herbs make good companion plants is not new. Some of the earliest written documents on gardening discuss these relationships. When selecting your companion plants you will need to consider more than which pests are deterred. Think about what each plant adds or takes away from the soil and what effect the proximity of strong herbs may have on the flavor of your vegetables. Try to avoid placing two heavy feeders or two shallow rooted plant types near each other. Nothing could be easier or more rewarding than starting a small herb garden just outside your back door, whether it be a home with a yard or the balcony of a high-rise apartment. Herbs like thyme, chives, parsley, marjoram, rosemary sage, basil and mints make good choices for the beginner's herb garden. These herbs aren’t fussy when it comes to sunlight, fertile soil or water. If there isn't a plot of ground available, herbs planted in a group of pots and containers clustered together near the back door are a good start for beginning gardeners. To simplify garden care for specific herbs, plant annual herbs (those that need to be replanted every year) and perennial herbs (those that grow back on their own each year) separately. It's important to till the soil to a depth of about 16 inches using a spade or a fork so that newly planted herbs have lots of room to spread their roots. Spacing between herbs plants such as chives, parsley and dill should be at least a foot. 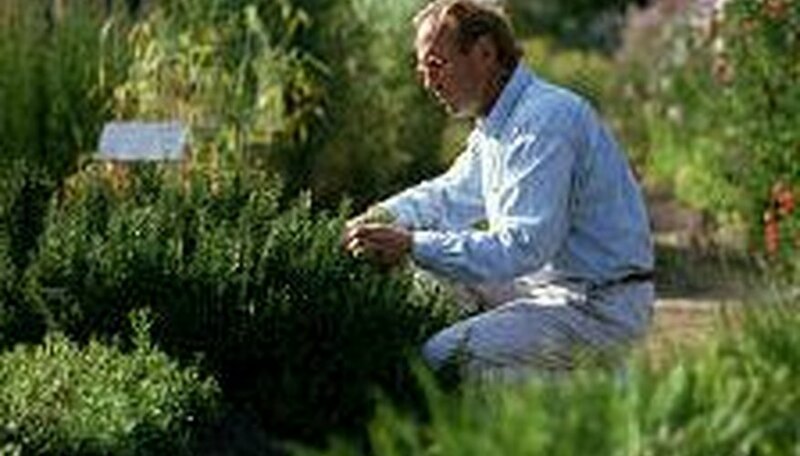 Rosemary, sage, thyme and basil need 2 to 4 feet between each plant. A member of the mint family, sweet basil (Ocimum basilicum) is a savory annual originally native to tropical Asia. The plant produces bunches of fleshy green leaves used as a seasoning in many different kinds of cooking, though it is particularly prominent in Italian cuisine. The fast growing, low maintenance plant does best in full sunlight (with a little shade in hot climates) and well drained, consistently moist soil. Dill (Anethum graveolens) is an upright, wiry annual that is recognizable for its blue-green foliage and tiny yellow flowers. Originally native to southwest Asia, Dill is an easy-to-grow, fast growing herb that is naturalized throughout much of North America and Europe. The plant requires full sunlight--it won't amount to much without a full day's worth of sun. Soil should be well drained and watered regularly. A native of western Asia and the Mediterranean, Arugula (Eruca sativa) is an herb similar in appearance to a radish plant, boasting jagged, green leaves and small stalks of whitish flowers. The leaves of the herb are frequently used in salads, or as a garnish. Like most herbs, Arugula grows best in full sunlight. The plant will grow best in soil that is well drained and consistently moist. Leaves should be picked before flowers appear for the best possible flavor. Lightly prune—but do not shape—woody perennial herbs in early spring, shortly after new growth occurs. Remove any dead growth with pruning shears. Use lopping shears for extra leverage if you encounter very thick stems (on large, scraggly rosemary plants, for instance). Take care to ensure you only remove dead wood, as cutting live pieces may damage or kill plants. After herbs bloom in spring or summer, you can shape them. Wait until flowers fade; however, do not wait too long after bloom, or you run the risk of damaging new growth that formed on old flowers. To shape, clip the soft stems of woody and non-woody perennial herbs by up to one-third. Cut just above leaf nodes approximately 3 to 5 nodes down the stem. Annual herbs like basil can be cut completely to the ground each fall, as they will need to be replaced the following year (parsley, a biennial, can be cut to the ground in its second year). Though it’s not necessary, you can lightly prune herbaceous stems throughout the year to maintain plant shape. Remember to regularly deadhead all herbs by pinching off flowers to encourage healthy growth. Herbs are fleshy-stemmed plants that die back at the end of a season. Herbs are best-known as aromatic plants used for seasoning or medicinal purposes. Ancient Abyssinians, Greeks and Romans grew such herbs as celery, laurel, dill, chives, mint and mustard. Herbs have been used in Europe and Asia for centuries for medicinal, aromatic and ceremonial purposes. Early Americans used herbs as medicinal remedies and to preserve foods. Herb garden plants are most popular as culinary or aromatic ingredients but are also used ornamentals. Native Americans grew herbs for dyeing cloth and tanning leather, as well as for cooking. Most herbs do best in full sun and in sandy loam. Most never need fertilizer. You can easily grow annual and perennial herbs from seeds or nursery plants. Pinch kitchen herbs back to encourage branching; blooming plants are making seeds and will stop growing. Choose plants you will use. Use herbs as companion plants in vegetable gardens, backgrounds for flower gardens or in a kitchen herb garden. Basil, parsley, lavender and mint are popular herbs with which children can easily help. Select one or more locations for the indoor herb potting containers. Most herbs require four to eight hours of sunlight or artificial plant grow lights for optimal growth. The location should have enough room to allow 6 inches of space between containers and room to set up plant grow lights. Fill each potting container 3/4 full with organic potting soil. Place one herb seedling in each container. Fill the remainder of the container with peat moss. Water the container until it drains from the bottom. Set up a plant grow light in your chosen location. Place each plant container under the grow light. Space the plant containers 6 to 10 inches apart to allow for air circulation. Fertilize the herbs monthly with fish emulsion. Leach pots every six months. Examine containers and transfer to larger pots every six months, if needed. Growing herbs organically means without the use of manufactured chemicals including fertilizers, weed control products, insect or fungus treatments. Applying organic growing methods is part of the sustainability agriculture movement that aims to reduce exposure to potentially harmful chemicals. Organically produced vegetables and herbs have become increasingly popular as more is learned about the harmful effects of chemicals in food and the environment. Many herbs are perfect candidates for organic growing because they naturally repel bugs and do not require extreme measures to grow well in most gardens. Asparagus spears emerge when the soil temperature is about 50 degrees Fahrenheit. The optimal size at harvest is 7 to 9 inches. Asparagus plants grow from crowns or seeds and produce for 15 years or more. 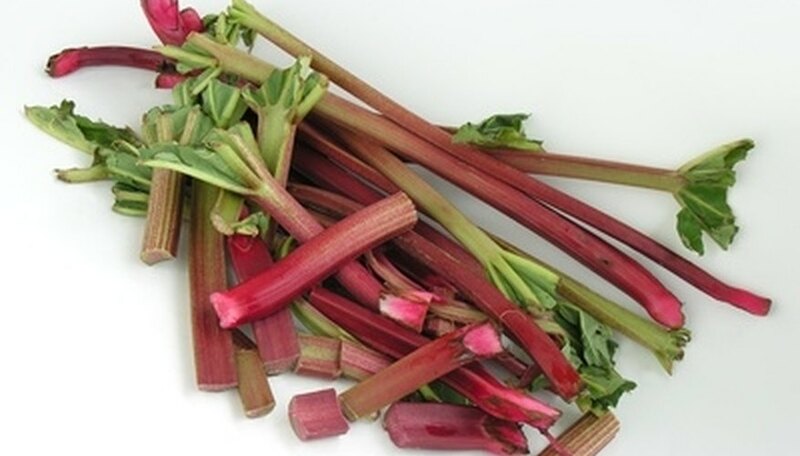 Rhubarb stalks are used in pie, bread, cake and sauce recipes. The red or green stalks are edible while the leaves are toxic. The cool season plant grows well in the northern areas of the United States. Rhubarb grows from crowns. The lemony flavored sorrel leaves are used in salads, soups and sandwiches. Individual leaves are harvested in early spring when 4 to 5 inches long. Sorrel is grown as an annual in cooler climates and as a perennial in warmer climates. Ground horseradish roots provide a pungent sauce for roast beef. The hardy plants grow 2 to 2.5 feet tall. The roots are dug after the first hard fall frost and before new plant growth appears in the spring. The plants grow from root cuttings and spread vigorously. Heads of white and red radicchio are a major ingredient in Italian salads. Garlic, a popular seasoning, grows in bulbs. Both types of vegetables are perennials but are usually grown as annuals. Lavender and lemon verbena provide a basis for potpourri. Catnip is a favorite herb for cats and provides leaves for tea. The remainder of the perennial herbs season soups, casseroles, meat and sauces. This list includes chives, French tarragon, mint, oregano, rosemary, sage and thyme. Perennial herbs grow well in pots and containers. The individual leaves or stems are harvested as needed for recipes. Mimic the hillsides of Provence, France, by planting rows of lavender. With its ethereal texture and sprawling nature, lavender is the perfect choice for softening a hillside landscape. English lavender will produce a stunning purple flower in the summer and the hillsides will look like a sea of color. This fragrant flower prefers well-drained soils, making this a perfect hillside herb. Plant the flowers in full sun to prevent yellowing of the leaves. 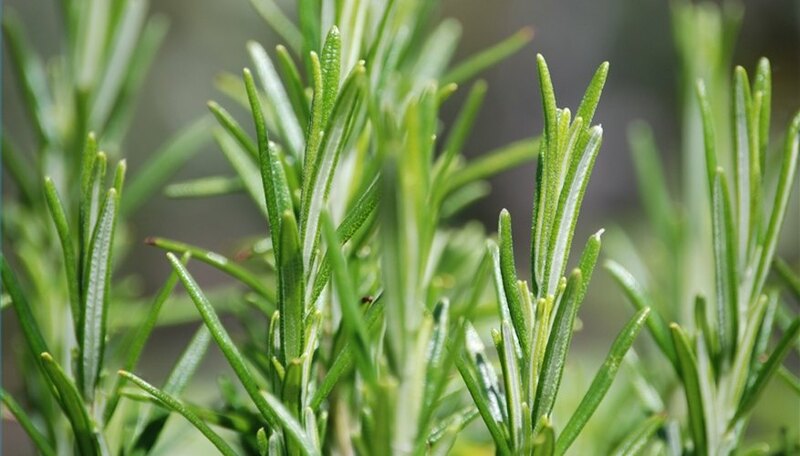 Rosemary complements lavender and other herbs with its pale blue blooms. Rosemary adds height and depth to a hillside. Its evergreen leaves and silvery green texture add luster to the slopes. Plant rosemary vertically or horizontally down and along the hill to create an herb wall. The common green variety, which is the most popular, can be paired with the goldstriped variety for a stunning hillside pattern. Rosemary needs full sun to thrive. A neat way to design herb beds is to plant individual herb varieties according to their height. Start at the top of the hill with tall herbs such as dill and cilantro. Basil and licorice will also add height and help to create a cascading effect. Next, bring in medium-sized herbs such as oregano, chives and marjoram. Low-growing herbs such as sage and creeping thyme will help to fill out the bottom of the slope. 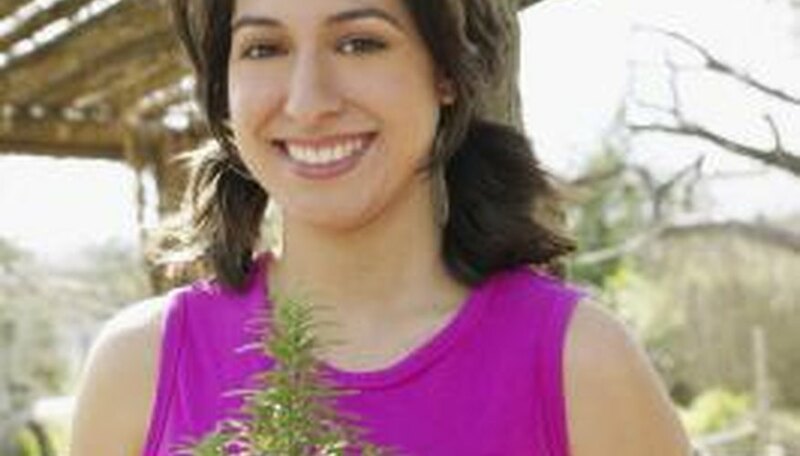 Remove sickly looking plants and stems from your herb garden. Cultivate around the plants, or use organic mulch to protect the soil over a larger area. Because lawn cuttings can be too absorbent, use gravel when mulching herbs, such as lavender, thyme or rosemary, that thrive in drier soils. Water mint, chives or basil, and any herbs that are in small containers, but only minimally unless the weather is very dry. For herbs planted in the ground, use about half of the amount of water that you would use for other plants, as herbs are drought-resistant and are able to withstand drier conditions better than damp ones. Create your own non-toxic pesticide for your herbs by picking leaves from plants that are unaffected by pests--mint plants are a good example--and boiling them in three parts water to one part herb. Allow the mixture to stand for 15 minutes, then let it cool, and strain it through a piece of cheesecloth. Pour the mix into a spray bottle and spray on affected plants. Store the spray for up to a week for reuse, then make a new batch, if needed. Bring frost-vulnerable herbs, such as bay, lemon verbena, scented geraniums or rosemary, indoors during cold winters. If replanting them every year is an inconvenience, you can keep them potted for easy transport. Cover frost-resistant or perennial herbs with a thick layer of mulch, including tree branches, leaves, straw or newspaper, when the ground freezes. Leave the covering on the herbs until the danger of frost has passed in your seasonal zone. To prevent rot, check on the herbs in mid-April, and uncover them on sunny days when new growth appears. Recover them on cold nights to prevent freezing. Determine the size of your herb garden. This will be the predominant factor in the number of plants you will buy. If you have a small space, consider using containers for growing herbs. Select herbs that will grow well in your hardiness zone while taking pride in your California heritage. Supplement herb garden staples such as basil, mint, thyme and rosemary with a selection of herbs that are native to California. Amend your garden soil to improve drainage and nutrient content. Till the area in which you will plant your herb garden, removing approximately 18 inches of soil. Place 3 inches of crushed stone at the bottom of the area to improve drainage. Mix 3 to 4 inches of compost and 1 to 3 inches of sand into the garden soil, and return it to your planting bed. Plant herbs approximately as deep as the container in which you purchased the plants. Space multiple plants apart according to plant directions; generally 6 to 12 inches. Water herbs thoroughly after planting and regularly throughout the growing season. Most plants require 1 inch of water per week. Harvest once the plant has enough leaves to maintain its growth. Picking your herbs too soon may diminish its growth and kill the plant. According to Rodale's "Ilustrated Encyclopedia of Herbs," while there is little research to explain why certain herbs harm others, gardeners have observed the same results for generations. Rue should not be planted near basil or sage. Sage should not be planted near any member of the onion or garlic family, including chives. Coriander should not be planted near fennel. 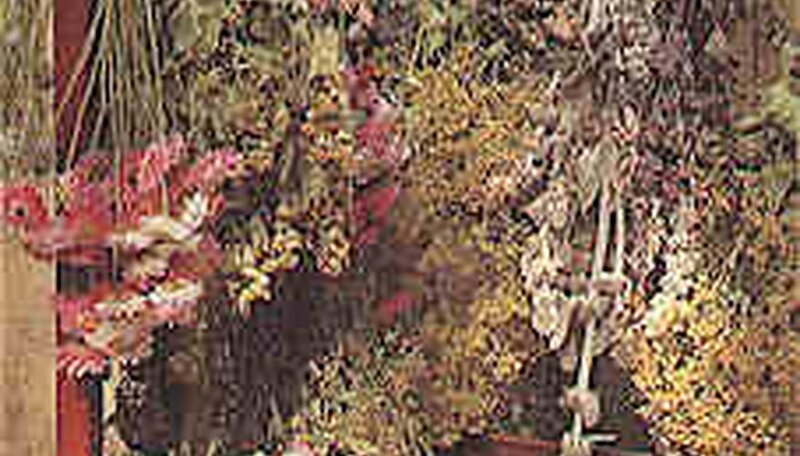 Different herbs thrive in different growing conditions. Each herb grows best in a certain type of soil, a certain kind of light, and each needs a specific amount of moisture. Herbs like bay laurel and lemon verbena thrive in hot climates and die if there is a freeze. Others, like nasturtium, dill and rosemary, thrive in full sun, so they should not be planted with a shade-loving herb like sweet woodruff. Some herbs grow prolifically and take over large patches of space; do not plant these herbs next to more delicate varieties. Mint herbs all spread above and below ground. Tarragon takes over large areas. These herbs will quickly overcome a smaller plant like chamomile. If you like to cook Italian dishes you know how important fresh basil is. Dishes such as pesto and marinara depend upon the sweet aroma of this tender herb. Growing basil is quite easy and can be done indoors, in pots. 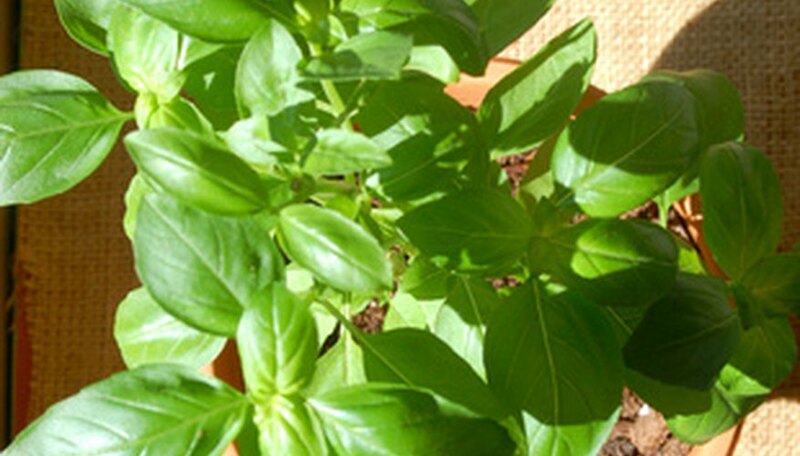 The most important aspect of growing basil is sunshine; the herb needs at least six to eight hours of sunlight a day. Oregano is a staple in Italian and Mexican cooking. This perennial plant is easy to grow in the home garden as long as you have a spot that will provide it with all-day sun. Harvesting the leaves is best done before the plant flowers, usually when it reaches 5 inches in height. This is an herb that will grow best in a dry, sunny location. Gardeners grow thyme not only for culinary use but as an ornamental plant as well. If you are growing it for use in the kitchen you will probably want to dry some of the herb. Just hang a bunch of thyme sprigs upside down until they dry. Thyme can be grown in full sunshine or partial shade. Herb seeds typically begin to sprout in 2 to 4 weeks. The tiny seedlings grow to full maturity in about 60 days for most species of non-woody aromatic herbs. Herbs purchased as young plants will reach maturity quicker as germination time is eliminated. Find a sunny location in your home--either a south or west window will do. Herbs must receive at least five hours of sunlight per day. Determine what size pot you will use. You can use a large pot for a variety of herbs, or single pots for each herb. If planting more than one herb per pot, be sure to place the largest ones in the center, and trailing herbs, such as oregano and thyme, at the edges. Mix two parts potting soil and one part perlite. Add stones or gravel to the bottom of each pot. Use your finger to make a hole in the soil and drop the seed in. The hole should be no more than three times the size of your seed. Cover lightly with soil and water. Cover with plastic wrap to keep the soil warm and place the pot or pots in a warm, sunny location. Do not allow the soil to dry out and remove the plastic once seeds have germinated. Water herbs once a day after the seedlings have emerged. Begin using your herbs when they have grown enough leaves, usually after four weeks. Some herbs, such as basil, should not be allowed to flower. The following herbs are commonly grown at home for use in cooking, but they can also be used to help re-grow hair. Sage is natural herb that helps to strengthen weak hair. Not only is chamomile soothing, but it is an excellent resource for promoting hair growth. Catnip is another herb that works well for hair re-growth, and budrock root offers double benefits of encouraging hair re-growth and reducing its fallout. Dong quai, a traditional Chinese herb, stops hair loss and promotes hair growth. Pygeum, available in capsule or pill formula, takes it origin from the bark of an evergreen tree and is effective at reducing male-pattern baldness. The American Botanical Council has found he shou wu to be effective at restoring hair growth. Stinging nettle is an herb available as a capsule or pill and has been found to be very effective at re-growing hair when taken in combination with saw palmetto, another herb commonly used for reducing hair loss and encouraging hair growth. Herbs are at their peak of flavor when they've just been harvested. Midmorning, just after the sun has dried the leaves but before it's too hot, is the best time of day to harvest. You can cut back as much as 3/4 of the plant without harming it. If the leaves are dirty, rinse them quickly in cold water and dry them with paper towels. The best time of year to harvest is before the flowers bloom. You can prolong the optimum harvest time by pruning off the flower buds as they form, but even the most attentive bud-nipper will find that the harvest season will eventually come to an end, and it's time to think about preserving some of your crop. Freezing is the best ways to preserve herbs. An easy way to freeze herbs is to place them in ice cube trays, cover with water, and freeze. Once they are frozen solid, place your herbal ice cubes in a plastic bag. Hang your bundles of herbs in a cool airy place, and place a paper bag over them. Make sure your herbs are tied in bundles small enough that they don't touch the sides of the bag when they are covered, and tie the end of the bag closed. Check back in about three weeks. When the herbs are dry they will crumble easily into jars for storage.